You MUST complete the MANDATORY entry to enter before any extra ways of entry are unlocked on the Rafflecopter form. Must be 18 years old or older to win. DustinNikki Mommy of Three doesn’t have a way to verify but winner may be subject to verify with company, sponsor, or PR representative if asked to provide proof of age when claiming prize. If the sponsor, company, etc. wants proof of age provided, it will be stated in the giveaway post. Entries are approved by DustinNikki Mommy of Three’s admin, Nicole (me) and is subject to my approval. If comments are not actual entries, they will be deleted. If there are duplicate entries, they will also be deleted. Negative and harassing entries (and this goes for comments on any non-giveaway posts as well) will be deleted and you will receive a written warning. If more than 2 offenses are made, your IP address will be recorded and banned from DustinNikki Mommy of Three. I feel strong about protecting all my readers and keeping my site fun and friendly. Any taxes or customs are the winner’s repsonsibility. All postings (content and images), entries, and links are the sole property of DustinNikki Mommy of Three and/or the posts sponsor. Winner will be contacted via email and MUST respond within 48 hours to claim prize. If I do not get a response, a new winner will be selected! Can you win even if you already won a giveaway from the same sponsor whether on my blog or someone elses? I don’t really have a rule against this. Most of the time a person who has won a prize from the same sponsor either on my own blog (I work with some companies more than once) or someone else’s has told me they had and gave up their prize so that someone else has a chance to win. I personally don’t have a rule against it and I most likely wouldn’t even remember or know if someone has already won. Even though I don’t have a rule against it, a sponsor may make that a stipulation and prize would be approved by the sponsor. If there is any stipulation of the sort, it will be stated in the giveaway post. Please Note: There have been a couple times that a sponsor did not honor a prize because of this without even disclosing it in the beginning. This has only happened twice since I have been writing my blog but please keep in mind that it may happen when you enter even if it happens NOT to be disclosed before entering. If this is the case, I cannot be held responsible for a prize not being honored due to multiple winnings. Giveaway prizes are shipped directly from the sponsor or company so it depends on how quickly they ship. I would allow 6-8 weeks before prizes arrive. I always ask the winner to let me know when they receive their prize so that I know it was sent. I know we all forget things sometimes but it is helpful if you remember. If a month or so goes by and you still haven’t received your prize, please send me an email (it’s easier if you reply with the same email since I don’t save anyone’s information) and I will contact the sponsor about it but please always allow at least 6-8 weeks. Please Note: I give all my trust to any sponsor I work with to honor any prize. I have had a problem once with a company/sponsor that completely “flaked” on a giveaway prize through no fault of my own. They never got back with me about anything and I had a winner that never received anything. I have done hundreds upon hundreds of giveaways and only once had this happen. I feel completely terrible about these things happening but upon entering any giveaway, you are agreeing that if for some reason anything like this should happen, you are not holding me responsible for giveaway prizes. You will have my most sincere apology and I will keep trying to get to the bottom of things with the sponsor. Something like that is or can be devastating to a blogger nevermind all the advertising and promoting of their product they receive. It’s a lot of my time and work and I will not work with those companies ever again. However, if this should happen although it’s not that likely, I will try to do something if I can. For example, if the winner is a blogger (most of my readership are bloggers themselves), I can offer a free ad space for their blog for a month or give a facebook and twitter shoutouts once a week for a month or something like that. Again, I cannot be held responsible for giveaway prizes which is why I state by entering any giveaway, you are agreeing that I cannot be held responsible. I am sorry I have to stipulate that but prizes come from them and not me. There are a few different types of giveaways that I post here at DustinNikki Mommy of Three. There are actually three different types and I wanted to explain the difference so there isn’t any confusion. The ones that are most confusing are some of the blog giveaways that I post here. This is the first type of giveaway. 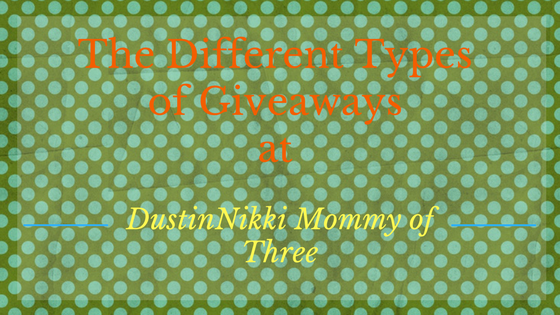 These giveaways are blog giveaways that are hosted by DustinNikki Mommy of Three. 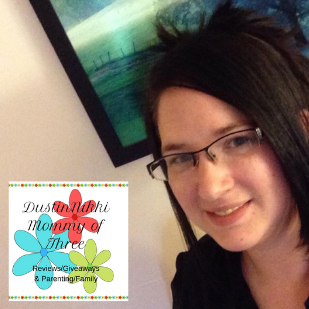 That means that DustinNikki Mommy of Three is actually running the giveaway. Recording entries and is also responsible for drawing winners and notifying winners. These giveaways are our giveaways. The majority of the time, these giveaways are sponsored by a company or brand that DustinNikki Mommy of Three has partnered with. These giveaways are usually followed after a product review. These giveaways are also obvious because I will mention that it is a DustinNikki Mommy of Three giveaway in some way multiple times in the review/giveaway post. For these giveaways, entrants can contact me if they have any questions. These giveaways are always entered on the blog at DustinNikki Mommy of Three via a Rafflecopter form unless I change my entry form in the future. This is where the confusion comes in sometimes. There are times that I post blog giveaways that can be entered by using an entry form in the giveaway post on DustinNikki Mommy of Three just like our own giveaways. I sometimes post these giveaways for other blogs and help them promote their giveaways. They may look like they are DustinNikki Mommy of Three giveaways, but they are not. I am helping these bloggers promote their giveaways in exchange for adding one or two of our social media links as extra entries into their giveaways. The giveaways that I post to help other bloggers are always clear that they are hosted by another blog. Their images will have their blog name on them. It will also be stated in the post who is hosting the giveaway. 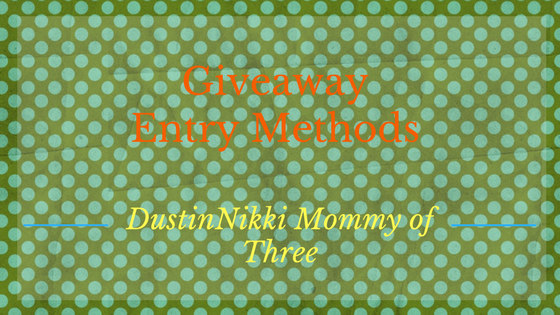 I also leave a disclaimer at the bottom stating that DustinNikki Mommy of Three is not hosting that particular giveaway. Any questions will need to be asked of the hosting blog. Their information will be in the post. These are pretty obvious when I post them. Sometimes I come across instant win games or a sweepstakes that is run by a brand or company. These don’t have anything to do with DustinNikki Mommy of Three or any other blog and are not giveaways you actually enter on the blog. When I post one, I will have information about the instant win game or sweepstakes, prize information, how to enter, rules, and even leave a link to the complete rules page. Included in those posts, there will be a direct link that will take you to that brand’s website that has the instant win game or sweepstakes where you will enter. I hope this clears some things up and helps minimize any confusion.